There was Munich, and there was Zero Dark Thirty and heck, now there’s Phantom. The difference is not that the first two are based on true stories and the last is a wish-fulfillment fantasy (a film you wish were true, the tagline states) but that the fictional film cannot beat reality. Even D-Day and Baby did a better job of the ‘avenging India’s honour’ theme than Kabir Khan’s Phantom. Seven years after the 26/11 attacks on Mumbai, when none of the masterminds have been apprehended, a fiery-eyed, teeth-gnashing, RAW man (Mohammed Zeeshan Ayyub) suggests to his boss (Sabyasachi Chakrabarty) that a covert mission be undertaken to kill the terrorist leaders, who planned the Mumbai attacks. The government cannot sanction the mission, and the person who undertakes it has to go alone, get no credit, and if he dies, no acknowledgment. They find such a man – a Phantom--feeding chickens on a remote mountaintop, sulking his military disgrace away in solitude. So far, the plot (taken from Hussain Zaidi’s novel Mumbai Avengers) follows the template of dozens of such vigilante justice movies in which a former soldier or intelligence operative is dragged back into the field. What happens afterwards is spectacularly silly. The way the killings are carried out are preposterous. 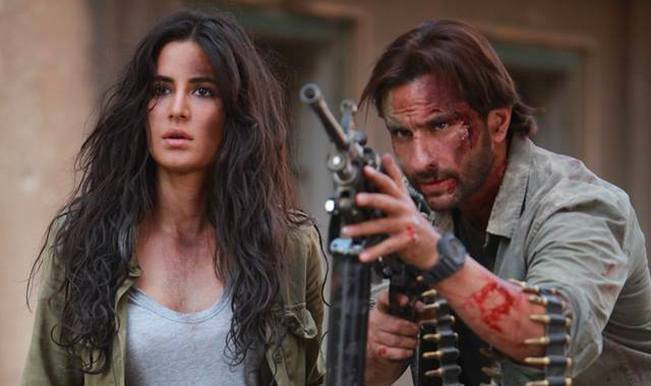 Even though the Phantom aka Daniyal Khan (Saif Ali Khan) and his reluctant Parsi helper Nawaz Mistry (Katrina Kaif) go globe-trotting, the pace is sluggish. A film like this should have been exciting and cathartic—it is really frustrating for Indians to watch helplessly as the country becomes a terror target—but there is not a scene in which the pulse pounds or the emotions are churned. This has as much to do with the boring script as with the miscasting of Saif Ali Khan as Katrina Kaif, whose one-expression performances (he scowls, she pouts) do nothing to help the film. Khan made the equally comic-bookish Bajrangi Bhaijaan work by simply casting Salman Khan; Phantom also needed an action hero with a better connect with the viewer. With all the resources at its disposal, it’s too bad that Phantom is not a first-rate, crackling thriller.